Under cream-white arches adorned with lanterns and silk, about 50 people wearing name tags with their preferred pronouns greeted familiar friends as they prepared to learn about being an ally to their Muslim friends, neighbors or anyone in the Pittsburgh area. 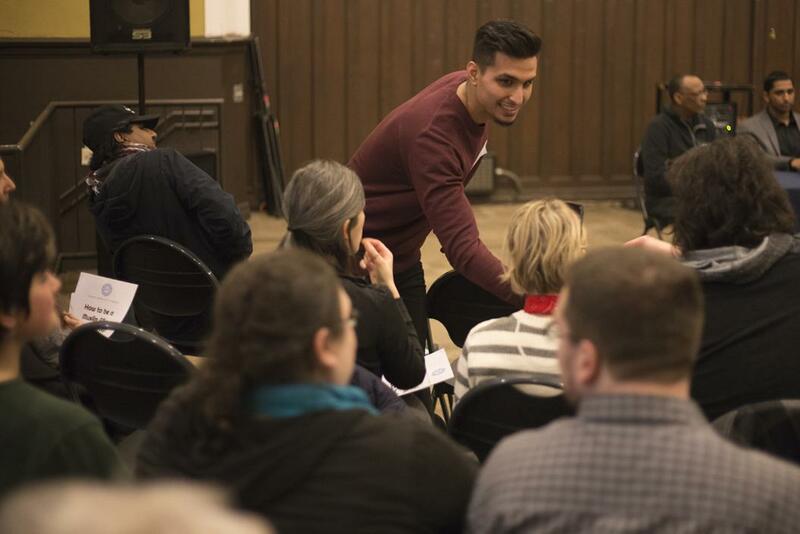 The crowd gathered at the Union Project in Shadyside Thursday night, expecting the second session of a similar ally-training event the Islamic Center of Pittsburgh hosted last October at the University Club. At this event, 50 students learned the basics of Islam, debunked misconceptions about the religion, and talked about eight ways to be an active ally. The wheel is a metaphor that Mohamed — a 2015 Pitt grad — used to describe the systematic oppression of various groups through American history. Women, Japanese immigrants and African Americans are at the bottom of this “wheel,” Mohamed said. During President Donald Trump’s campaign, Mohamed said multiple oppressed groups — Mexicans, Muslims and women, for instance — were relegated to the bottom of the wheel based on what was beneficial to the campaign at the time. Mohamed and the ICP have made an effort for the last two years to educate the greater Pittsburgh community on Muslim traditions. Through interfaith ceremonies, community dinners and public speeches, he’s tried to fight potential fears or criticisms with information. But for him and many in the Muslim community, being an ally in this political cycle is more than just being educated about Islam. According to him, what gets lost in this battle for identity and proper recognition in any community is awareness of the continued oppression of other groups. Ryan Coble, 27, of Swissvale listened as Mohamed encouraged the crowd not to “forget and move on” after winning a small battle in the fight against inequality. He was there to gain exposure to another culture. “I like events like this because I know I grew up in a very sheltered background,” Coble said. Coble, like many others at the event, was hoping to become a more educated member of society. According to him, it becomes easier to call someone out on their ignorance if he can challenge their misconceptions with actual facts rather than simply acknowledging that it is wrong. Samantha Oliver, 30, of Morningside, shared these views. She saw the event on Facebook and decided that she wanted to become more educated about the Muslim community. “[I like] the idea of sharing knowledge,” Oliver said as she stood in a group of people eating some of the free foods offered at the event. She was one of many people swarming Mohamed, asking for more ways to engage with their Muslim friends. Mohamed said the Muslim community in Pittsburgh now has a platform to educate people who are willing to learn not only about Islam but about justice for all past, present and future victims of oppression. “To be a Muslim ally today is not only about supporting Muslims — it’s about destroying this wheel,” Mohamed said.